KIM YUAN Gloves, committed to providing each customer with the highest standard of customer service, with the highest value for money in the gloves industry. 100% Genuine grain cowhide - Made from carefully selected high-quality cow leather, material is naturally breathable, sweat-absorbent, and comfortable. Elastic wrist design will keep dirt and debris out of the inside of the gloves. Gunn cut and keystone thumb design -These gunn cut gloves have superior durability and flexibility because the seams are set away from the palm. Soft and flexible with moderate oil resistance, puncture resistance and cut resistance, also with thermal protection and insulation properties. Unisex gloves, ideal for cutting, gardening, yard work, climbing, fencing, landscaping, carpentry, lumber, stonework, construction, motorcycle riding, heavy truck driver, demolition, warehouse, ranching, farming, hunting, machinery and so on, it is a perfect tool for all type of work. We offer a 100% satisfaction guarantee. If the gloves are defective or damaged within 90 days, will replace it for you or provide a full refund so can feel confident purchasing with KIM YUAN. FULL GRAIN COWHIDE ▶ 100% Genuine Leather - Made from carefully selected high-quality cow leather with thickness depth above 1.2mm which is not only thick and sturdy but soft and supple. If you have any type of outdoor tasks to do these are the gloves to get, they are both comfortable and rugged enough that you only need one pair, and it will last long. COMFORTABLE TO WEAR ▶ The elastic wrist design will keep dirt and debris out of the inside of the glove, and the inside would not prick the hand, it gives you a natural & flexible experience. GUNN CUT AND KEYSTONE THUMB DESIGN ▶ These gunn cut gloves have superior durability and flexibility because the seams are set away from the palm. 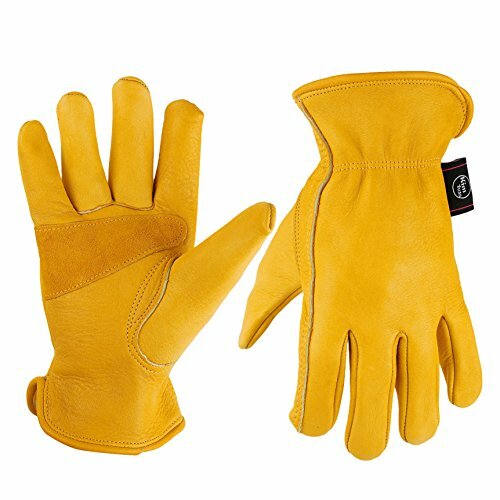 WIDE RANGE APPLICATION ▶ This glove features and excellent quality make it useful for Yard, Motocycle Driving, Gardening, Construction, Fence Fix, Trucking, Heavy Duty Work, Wood Cutting, Warehouse, Camping, Ranch/Farm, Landscaping, Diy, Garage, Moving, Welding, Grinding, Chopping, Mulching, Digging and any heavy or outdoor work. PROFESSIONAL MANUFACTURE ▶ Kim Yuan has more than 20 years of experience in the production of leather work gloves, so we know how to select High Grade leather and make High Quality working gloves, we are confident that these gloves can be compared with the similar gloves in the market.